Reed Diffusers are a fantastic alternative to the usual scented candle when it comes to making your home smell delicious and inviting. Combining use and beauty, Reed Diffusers are pretty to look at and offer a decorative element to your home in addition to their yummy aroma. You can’t use a candle without the risk of an open flame. Reed Diffusers offer a safer approach when it comes to scenting your home. Essential oils are poured into an ornate glass container and then several rattan reeds are placed into the jar. These long, slender sticks then absorb the oils and emit their scent in an even, constant fashion. Most Reed Diffusers will last for months without needing to be replaced and need very little attention to keep your home or office smelling grand. Just flip the reeds every few days to make sure the scent remains strong. Not all Reed Diffusers are created equal. These five best reed diffusers offer top-notch quality as well as durability. Any one of them would make a lovely aromatic addition to your environment. 2 Which Reed Diffuser is Right for You? Lavender is well-known as one of the most relaxing scents available. 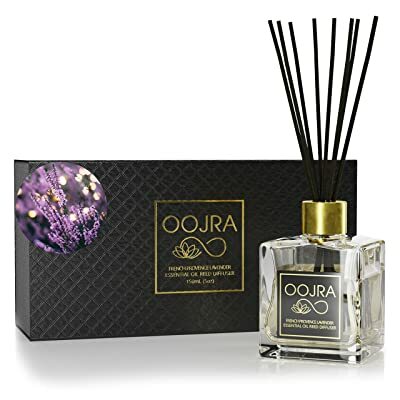 OOJRA’s French Provence Lavender Reed Diffuser offers a soothing, clean lavender scent with underlying minty and woody notes. OOJRA claims that their 5oz bottle will last between 3-5 months. The package comes with a reference guide meant to help you balance the potency of the product with the size of your space. Largely considered the best lavender-scented diffuser available, this is perfect for those seeking to establish a calmer vibe in their environment. 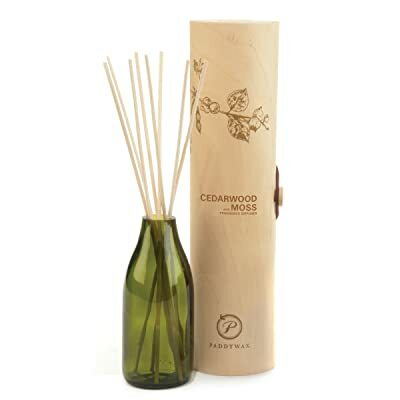 Paddywax is famous for their candles, but their Cedarwood and Moss reed diffuser is also a top-quality option for those seeking a long-lasting, warm and earthy scent. The 4oz bottle is said to keep the good smells coming for up to 4 months of continuous use. The eco-conscious company uses upcycled wine bottles to hold their products. The dark green bottle makes a handsome addition to many spaces, especially those with a more masculine feel. This is a very powerful diffuser best used in more open spaces such as living rooms and foyers. 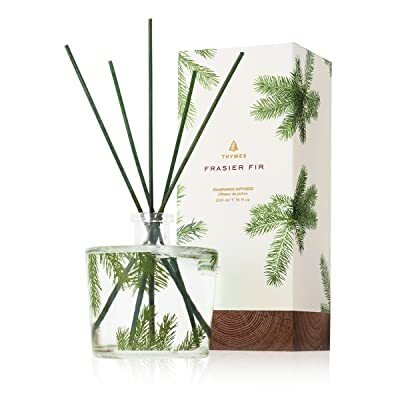 Lovers of crisp and clean aromas will enjoy the Frasier Fir scent offered by Thymes. Users claim that having one in the home is like walking through a forest of fir trees. This long-lasting diffuser comes in a 7.75oz bottle, making it the largest on the list. While some diffusers require that you purchase the entire set again whenever you run out of oil, Thymes offers the option to purchase a full-sized 7.75oz essential oil replacement. That factor alone is reason enough to give this heavenly diffuser a try. If you ascribe to the “variety is the spice of life” belief, then this is the option for you. Karma Scents has created a set of six 2oz essential oil diffusers, each a different scent. Lavender, Rose, Vanilla, Patchouli, Jasmine and Sandalwood are included in the kit. The individual bottles are smaller than the rest of the diffusers on this list, but the combined 12oz makes this the highest volume of oil contained in any of the other options. As the bottles are small, they’ll fit perfectly in a bathroom or studio apartment. Give each scent in the set a try and see which you love the most! This warm, spicy scent creates a sensual mood wherever it is placed. 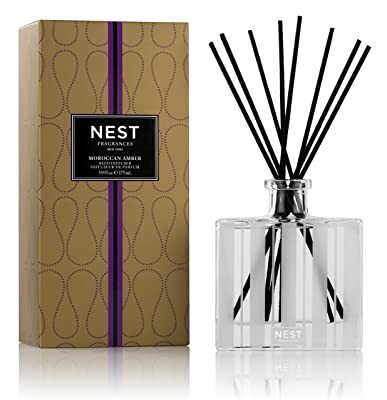 NEST offers a 5.9oz bottle of their Moroccan Amber scent with notes of bergamot, patchouli and a whisper of eucalyptus. Though the aroma is on the sultry side, it has a clean element (thank you, eucalyptus) that saves it from being heavy. The bottle is the most refined and chic of any on this list and would make a sophisticated addition to the home. Use this in a more open space as the scent can come off very strong. Which Reed Diffuser is Right for You? While all of the above diffusers are great options, there are still some factors to consider when settling on the diffuser that will make the perfect addition to your home or office. Here are some things to think about before you make your final decision. Smell is one of our most powerful senses and can provoke memories both good and bad. It’s important that the scent you choose is one you wouldn’t mind smelling every day for months. If you’re not sure which scent you’ll like, head to a department store or perfumery where you can get a feel for which notes you do and don’t enjoy. Once you know which scents make your soul sing, it’ll be easier to find a Reed Diffuser that matches the notes you love. If you’re hesitant about the potency of the scent, go for a diffuser with a lighter, cleaner smell like lavender rather than a heavy and dark aroma such as patchouli. If you’re really not sure, but you want to take a risk on a certain fragrance, check the store’s return policy to ensure that you can return or exchange if you end up rethinking your decision. Some diffusers are more powerful than others. You can adjust the potency by using less reeds in the jar, which reduces the amount of essential oil that is absorbed and then released into the air. Generally, bedrooms need six to eight reeds. Living room spaces require roughly ten to twelve sticks. If you’re thinking about a Reed Diffuser for a bathroom or other tiny space, choose an option that advertises a subtler aroma and only use four or five reeds. Another factor to consider is the size of the opening on the bottle. A smaller bottle opening will produce a less potent scent than one with a larger opening. A big open living space won’t be fully covered by a tiny bottle opening, but that same bottle may be perfect for the bathroom or smaller bedroom. Part of the charm of Reed Diffusers is the bottle. Most options out there are designed to be decorative additions for your space. Think about where you want the diffuser placed and choose an option you know won’t stick out like a sore thumb. Love the smell but don’t love the bottle? Snag a pretty container that you love and pour the oil into that. Better still if the oil comes in its own separate bottle already. Get creative and make it your own! Reed Diffusers are touted for their eco-friendly ingredients. However, make sure you check the label and choose a diffuser that comes with a pure essential oil, not an alcohol-based fragrance. Other factors to consider are whether or not the diffuser is paraben-free and phthalate-free, and if the diffuser is CARB compliant. When most people think of ways to create a pleasurable aroma in their home, candles are often the first thing to come up. However, Reed Diffusers are a worthwhile alternative to consider. 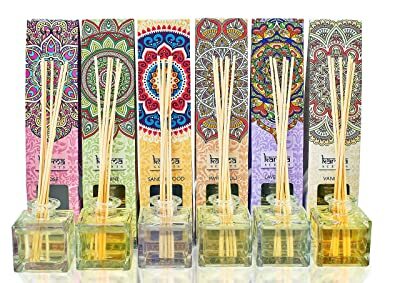 Not only are Reed Diffusers an effective method of scenting your home, they are safer than candles and more attractive than a traditional misting diffuser. Investing in a Reed Diffuser will up-level the fabulous factor in your space. Any option on this list will make a great choice for your home, office or beyond. Find a scent or two that you love and get ready for aroma-induced bliss. Q: How Do I Use My Reed Diffuser? Place a few ounces of oil in the bottle. Place the rest of the unused oil in a dark and cool place. Add a few reeds to the open jar. The number of reeds will be less for smaller spaces, and more can be added if the scent needs to fill a large space. Turn the reeds over every few days to ensure that the scent remains strong. The tips sticking out will end up submerged in the oil. Wipe the excess oil off the reeds to avoid dripping. The oil will last longer if you turn only a few reeds at a time, so use your judgement when flipping reeds. If the scent has only diminished slightly, don’t turn all the reeds over at once. Change the reeds when you change the oil as the reeds get clogged over time. Sometimes confused with bamboo, rattan is a thin reed that contains channels in its core. These channels are what makes them perfect for diffusing, as the oil is able to travel up these channels to be released into the air. Q: Are the Reeds Reusable? No. Use them as long as you are using the oil, and then replace them. They get clogged and lose their effectiveness over time. Never use the same reeds for two different scents as this will create a muddy, unpleasant odor. Q: How Much Oil Do I Use? If you have the option to add the oil yourself, use only a couple ounces at a time to retain the potency of the product. The remaining oil will last longer when placed in a tightly sealed container in a cool, dry place. Add more oil as needed. Q: How Many Reeds Should I Use? It depends on the size of your space. Smaller spaces may only need a couple reeds, while larger rooms or areas may need six or more. Go with the less-is-more method when starting out. You can always add more if you find that the scent isn’t powerful enough. Q: Can I Use Different Scents in Different Rooms? Absolutely. No Reed Diffuser is powerful enough to fill an entire home on its own, which allows for the opportunity to curate the scents in each part of your space. Perhaps you want something more soothing for the bedroom, fresher in the bathroom and warmer in the entryway. Play around with scents and turn your home into a journey for the senses. Q: What if My Diffuser Stops Producing Scent but There’s Still Oil in the Bottle? Odds are the reeds are clogged and need to be replaced. If you’ve been using the same reeds for a while, try turning them over first. If that doesn’t work, switch them out for new ones. Q: What Safety Measures Should I Take? While there is no open flame to deal with, the oils are flammable and should be kept away from any open flame. Placing candles next to reed diffusers is a no-no. Place the diffuser out of the reach of children and pets, as the contents can be toxic if ingested. When you find the perfect place for your diffuser, make sure you place a coaster underneath it to save your table or counter from damaging oil drippings. When you flip the reeds, do so over a sink or garbage can to catch any drops of oil. Are Essential Oil Diffusers Harmful to Pets? What Should I Do? Best Bassinet Reviews 2019 – Which is Right for Your Baby? Important Disclaimer: The information contained on Womensg.com is intended for informational and educational purposes only. Any statements made on this website have not been evaluated by the FDA and any information or products discussed are not intended to diagnose, cure, treat or prevent any disease or illness. Please consult a healthcare practitioner before making changes to your diet or taking supplements that may interfere with medications. Womensg.com participates in the Amazon Affiliates Program - if you make a purchase after clicking a link from Womensg.com to Amazon.com, we will receive a small percentage of the sale at no extra cost to you. Thank you for your continued support!